-Die SWEETHEART MÜTZE HÄKELANLEITUNG ist komplett auf deutsch geschrieben! -MÖNSTER TILL VIRKAD HJÄRTEMÖSSA är skrivet med svenska termer. 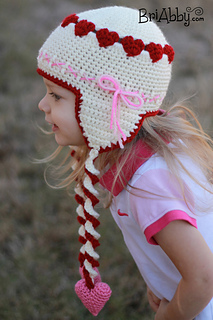 This pattern can be used for the ultimate Valentine’s Hat or just for the ultimate cute girly girl hat! It looks great in many different colors! 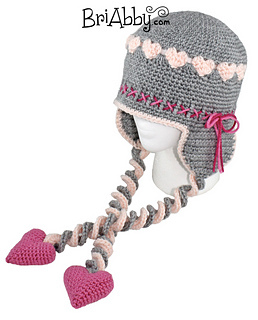 If you have any questions as you are making your hat, I would be happy to help and my email is listed on the pattern. This comes in PDF format and is 14 pages long. 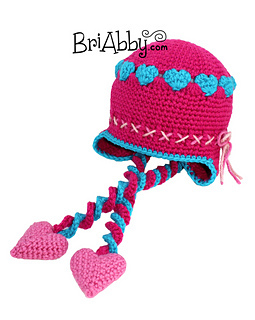 You are welcome to sell any items made from this pattern but you must give credit with a link back to my website www.briabby.com. This pattern along with all images are copyrighted and you must use your own photos to represent your work. 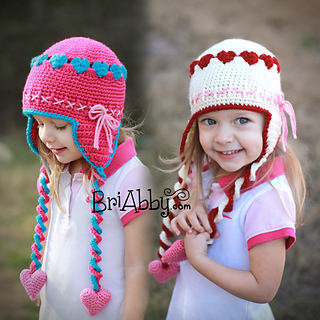 Like us on facebook at https://www.facebook.com/BriabbyHats if you’d like to see our new patterns as they are released, hear about sales & have a chance to win free patterns!